I chose to watch the remake before the original and immediately regretted that decision after realizing that this isn’t your average revenge flick. It’s a lot darker and filled with more surprises than I first anticipated. Going into the original knowing the general storyline and plot diminished the effect of the first half of the film, luckily due to changes in the remake there were still a few pleasant surprises and twists that I didn’t see coming. I think if I would have been a bit smarter and chose to watch the original first I would have instantly loved it. The initial reasoning behind watching the remake first was to give it a fair chance so that I wouldn’t be comparing the two constantly, but this is just one of those films where this can’t be prevented. Firstly the story is unique providing plenty of plot twists to keep us guessing. Once knowing these twists, it’s hard to stop waiting for them to happen in the original. Luckily the remake didn’t stay completely true to the original and made a few plot changes but those were the only changes made. That’s what makes the remake incredibly pointless in my opinion. It didn’t offer anything new, apart from a western cast and a neo-noir tone. Why remake a film and change virtually nothing about it. Usually what you’d like to see in a remake is perhaps a unique style true to the director or something different creatively but the 2013 version felt lackluster and ultimately not worth filming especially when you have a pretty perfect counterpart. We’re introduced to Joe Doucett leaving a lunch meeting drunk, what first seems acceptable turns unacceptable as he urinates in public and adds more booze into a soda cup before returning to work. He later shouts at his wife for nagging him to attend his daughters 3rd birthday party and hits on his clients wife who has no interest in him. It’s safe to say that he isn’t a pleasant man at all. We’re not meant to like him but we can tell that not even he likes himself as he spits at a mirror while staring at his reflection. He seems to have given up on himself. After a booze filled night he’s snatched off the street and awakens in an unfamiliar room which he’s trapped in. We don’t really get a sense of that revenge until he is released from the room. Whilst in the room it’s more about his self improvement and redemption in order to be worthy of his daughters forgiveness when he is let out. I suppose that is what prevents him from going insane. Without giving anything away this film tackles some dark themes which would make a lot of people feel uncomfortable, but this film lacked grit and an appropriate tone to support it. It felt too mainstream and lacked style, the cinematography, characters and locations felt generic which ruined what was supposed to be an eerie film about revenge. Instead it came off as your average blockbuster film. What I liked about this film was the added noir tone. It felt appropriate during the scenes where Brolin and Olsen are trying to figure out who trapped him in that room. But then there would be an abrupt change in tone during Brolin’s hammer to skull combat scenes. Sometimes it would feel out of place especially the iconic hallway tracking shot. It was always going to be a hard scene to pull off and unfortunately it looked awkward. Having not seen the original before this, I can say that was my first reaction. Brolin was awesome but the extra’s made the scene feel gimmicky with over the top reactions and unrealistic movements, some moments were cool but others were off. Talking about extra’s, they seemed to burden the film with below par acting. Not only the iconic fight scene but a couple of flashbacks too. If someone points a shotgun at you, I’m pretty sure you’d flinch, at least a little bit. Josh Brolin proves to be one of the few positives coming out of this film , showing that he can be a strong lead and carry a film. Another positive is Sharlto Copley, now cementing his status as king of accents. It may be slightly off in this film but his stiff interpretation of Brolin’s mysterious enemy makes him an intriguing character. It was interesting seeing Elizabeth Olsen for the first time, it gave me the chance to see if she’s Avengers worthy. She was solid but maybe due to the script she felt monotone. We don’t really sense her troubled past or any hardship, the only time we sense it is when it’s spoon fed to us or the first scene we see her with Brolin where she’s wearing a scruffy torn T-shirt, then minutes later we see her wearing a nice blazer. The only thing that signified to me was whether she was homeless or not, not every druggie has a torn up shirt! Oh Dae Su is an obvious alcoholic as we’re introduced to him at a police station being a nuisance. He says all he does is try to get through the day, which suggests he struggles in life and in a way might have already given up. He may be unhappy but he shares a sweet spot for his daughter despite continually being absent from her life. From the opening we know he’s done some bad things and may not be a pleasant person. Before we know it he’s been picked up from the side of the street and trapped in a room. Compared with the newer version, the transition to his entrapment is a lot quicker, you could say the remake spoon feeds the audience the plot and also gives us a more direct interpretation of the character. With Oh Dae Su we can understand him the way we want to. There’s more emphasis on his growing insanity within the room which the remake didn’t touch on, to put the cherry on the top there’s an explanation to why he never gave in to the insanity which is what I was wondering the whole time. When he’s released he saves a man from committing suicide but it becomes apparent that he hasn’t completely changed, he still lacks compassion but he’s fitter and driven with only revenge on his mind. In that respect there is more emphasis on revenge which the remake didn’t have. Themes of vengeance are relevant throughout the film, when we learn more about the person who trapped Dae Su. We learn the extent to which revenge can go and what holding a grudge can do to a man. For Dae Su, remorse slowly creeps in on him once he figures out who the mystery man is. Performances are great from everyone in the cast. The lead Min-sik Choi is phenomenal, a character which will stay with me for a long time. He finds the perfect mix of grit, anger and insanity. Gang Hye-Jeong plays the female supporting role convincingly, we buy into her loneliness and hurt, making her a character we believe in. Playing the mystery man is Ji-tae Yu who is portrayed as this charismatic, suave, insane, evil man. In terms of antagonists, this is as good as it gets. The blend of violence and dark humour is emphasized by the films overall offbeat tone. It gives the film consistency and style which the remake lacked. The screenplay is also better with narration, memorable quotes and metaphoric messages that move the narrative along nicely. There’s no question to why this is a cult classic, I’ve not seen a film as interesting, fast paced and intense as this in a long time. The original is miles better than Spike Lee’s remake. I’m all for a remake, but only if it’s justified. Foreign films have been adapted before, it’s not uncommon, but usually there’s a unique spin on them. For instance Prince Avalanche and The Departed. What makes the original so much better is the script, it has all the plot holes filled which the remake had. I don’t understand why you would take a film with a perfect story line and change little things like making the protagonists imprisonment 20 years instead of 15. Little things that create plot holes. 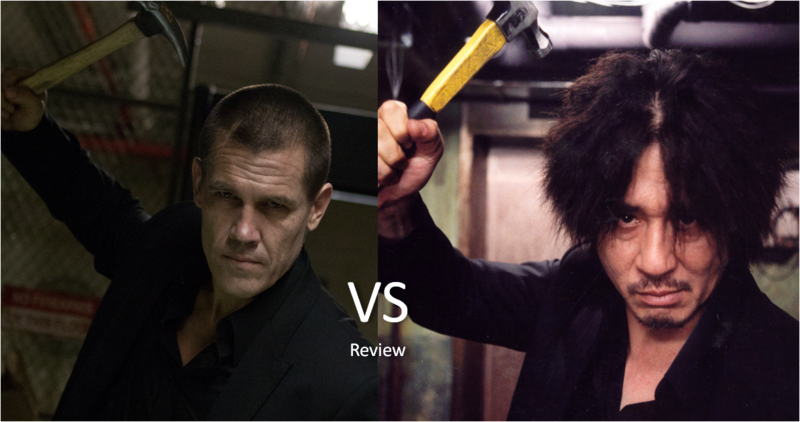 As for the characters, as good as Josh Brolin is, he doesn’t come close to beating Min-sik Choi and his awesome hair. But even overall the characters are richer in the original. I didn’t like Elizabeth Olsen’s take on the female role at all. I didn’t buy into her vulnerability as much as Gang Hye-Jeong’s Mido. As for the antagonist, Sharlto Copley was absolute gold but it didn’t feel appropriate for a film like Oldboy, he felt gimmicky. Ji-tae Yu was just as suave as Copley but his anger and desire for vengeance felt real, you almost feel for the character. Overall Chan Wook Park’s film smashes the remake… in the skull… with a hammer. This entry was posted in Special Features, Subtitles and tagged 2004, 2013, Chan Wook Park, Critic, Elizabeth Olsen, Elizabeth Olson, Film, Film Rating, Film Review, Gang Hye-jeong, Ji-tae Yu, Josh Brolin, Min-sik Choi, Movie, Movie Rating, Movie Review, Oldboy, Oldboy Korean, Oldboy Original vs Oldboy Remake, Original, Remake, Revenge, Revenge Film, Review, Rozeminho, Screen Fix, Sharlto Copley, Spike Lee, Spike Lee Remake, Spike Lee Version, Vengeance by rozeminho. Bookmark the permalink. Thanks a lot, I appreciate the comment 🙂 Yeah I hope people don’t make the same mistake as me, the surprise factor is everything! Perfect review, now I really want to see the original. I wasn’t impressed with the remake, despite Brolin relatively good performance. Cheers.